WirelessDoc: MIT-EF Connected Healthcare Conf. As part of my coverage of the MIT Enterprise Forum conference "Connected Healthcare" from this past Thursday, this post will cover the presentation by Douglas McClure, Corporate Manager, Partners Telemedicine. He mentioned that his organization was a group of 30 individuals who are in the active pursuit of the "creative deconstruction of healthcare." This he followed by saying that they had a simultaneous pursuit of "allowing healthcare to scale." Basically, this means using tele-medicine projects to reduce hospital and clinic costs while attempting to service the burgeoning elderly population, especially when treating and managing patient with such chronic diseases as CHF, HTN, COPD and diabetes. He also cites what he calls the "Pareto Principle on Steroids." Instead of the well-known 80/20 rule, for his patient population, 4% generate 40% of the costs. Given these realities, more efficient care of these patients is necessary. As one example, he talked about the Partners Wound Care program, where a nurse specializing in wound care is sent out to visit patients at home, some times 2x to 4x per day, at a cost of "$120 a pop." One idea is to have the patients use cell phone cameras to photograph these lesions and transmit them to the clinic as a better way of judging the healing progress. Right now, despite the megapixel cameras which are available on some cell phones, the lens is the limiting factor. When the optics are improved, he feels that this will be a workable solution. This lead to another project in the works, which he is testing in his home, using devices called the Sim Pill and the ambient orb. For a little background, the ambient orb, is just a translucent globe with an lcd that turns different colors based upon data input. It has been used to monitor the Dow, red if it were on the downturn, and green for a rise. This way it could act as a quick visualize reference prompting you to think, should I do something? In his application, the orb is networked with an electronic pill box, the Sim Pill which monitors if you'r taking your meds or not. By quickly glancing at the orb, the patient can tell if he or she is being compliant. Finally, he mentioned his org's Web site, www.connected-health.org/, which has a discussion forum. This is how Don Jones, VP of Business Development in Healthcare for Qualcomm, described the phenomenon of ubiquitous cell phone usage. I don't think anyone can disagree with this, but they still haven't imagined not only what's in store, but what's available now for personal management of medical conditions. He said that when mobile video telephony is cheap, the value of the cell phone as a medical diagnostic device will increase. And, with E911 capability, location sensitivity will allow location of the person who needs medical attention. When the modified cell phones are already out that act as peak flow meters, there are some amazaing devices such as continuous glucose monitoring devices, and something he called wireless bandaids. These are sensors that attach to the skin as with regular bandaids but will provide data wirelessly to the cell phone. In all these models, the cell phone acts as the intermediary to either display or record information, or as a gateway to send the data to another repository. There is a handheld device that is capable of using ultrasound imaging, designed to monitor the patency of the carotids. There is a 12-lead ECG bandaid that will interface with a cell phone. There is speculation that such a monitor could detect the onset of a coronary event 15 minutes before it become clinicallly apparent. He talked about a NIH-funded project where electronic pill bottle, manage again by the cell phone, would dispense meds at a regular schedule and record if the meds were taken. In this way, it also serves as reminder or compliance tool. The Germany company Biotronik has a product that is provided to cardiac patient who leave the step-down unit with an implanted defribrillator. Vocel is working on using the Pill Book on a mobile phone and marketing it as the "Pill Phone" as a means to help the public decipher the necessary information about the meds they are taking. I wish that this were all presented on the Qualcomm Web site which doesn't seem to say much of anything of the medical applications of a smartphone, but certainly this doesn't reflect the enthusiam I noticed in the crowd about the prospects of these devices. He said that he had a bagful of cell phones modified to act as glucometers where you could place the test strip directly into the side of the phone and record the results. There was such a rush of people from the audience, I decided to take his word for it. Connected Healthcare: How to make it work? 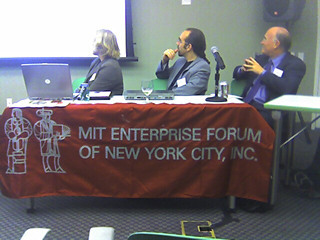 This was from just a few hours ago at the "Connected Healthcare" presentation hosted by the MIT Enterprise Foundation. It featured analysts, established tele-health companies, and VCs brought together to discuss what business models were likely to provide the best return for long term investment. Overall, this was one of the best presentations I've attended regarding the business of wireless disease management. I took copious notes, so it will require a series of blog posts to cover all the relevant material presented. I overheard one attendee say that almost always events like these are "thinly attended, but this one was packed." I have to agree, and also add that the audience was energetic and hungry for information. The consensus was that for several reasons, the time was right for pursuing projects in tele-health. I had to clear out of the way as the audience rushed to the panel table at the end of the session. The only disappointment was the lack of representation by clinicians. In fact, one attendee brought up the issue of how this new system of treatment at a distance would impact physicians, and if anyone considered what they're reaction would be. I'll cover this issue in another post. Much credit is to be given to the producers of this presentation, with so much good analysis being presented in the span of two hours. Thanks to Stephanie Cion of Aetna for the invitation to this most informative event. As I said, in the next few days I'll present all the salient points, provide links, and get the discussion rolling in the blogosphere.